What Card Will You Play? Is it, “I can’t do it” or “I won’t do it”? They may sound the same, but they are worlds apart when it comes to victory in Christ. One statement is about playing the victim card and the other is the victor card. The “I can’t” statement leaves victory in another person’s hands. It says that someone else did something to me or is not doing something for me that keeps from me making a decision to be free from my drug of choice. Remember this truth: freedom in the hands of another is not freedom. Christ came to make you a victor, not keep you a victim. You can always choose to filter life using your biblical tools and experience freedom no matter what someone else does or doesn’t do. Jesus has given you control of your freedom by giving you a choice (Rom. 6:12-14). The “I won’t” statement leaves victory in your hands. It says you know what to do, can do it, but you’re choosing to not to do it. This honestly lays the decision whether or not to take your drugs of choice squarely where it belongs … at your feet. That’s tremendously freeing! By switching from “I can’t” to “I won’t” you’re at least failing forward. You’re making a hopeless situation look a little brighter by grabbing control of the decision making process. You don’t have to wait on someone else to be free! 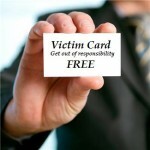 What card will you play today – the victim or the victor card?